Thanks to a historic and grudging compromise, water and salmon head back to the San Joaquin River, six decades after they were taken out. 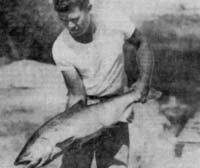 Three generations ago, the San Joaquin River was home to one of the largest chinook salmon runs on the West Coast. Spawning fish returned from the ocean in such large numbers that local farmers speared them with pitchforks and fed them to their hogs. Then, in 1939, the federal Bureau of Reclamation began pouring the first of 4.3 million tons of concrete to build Friant Dam and supply water to farms from Fresno to Bakersfield. For a couple of years after the dam was completed in 1945, the bureau still released some water downstream, and the chinook adapted and began spawning in pools below the dam. In 1948, a crew from the state Division of Fish and Game lent the fish a hand, trapping 2,000 salmon from the lower reaches of the river, trucking them past a dried-up stretch, and releasing them in those pools. By 1949, however, the Bureau was holding back the river’s entire flow behind Friant Dam. Undaunted, the Fish and Game crew erected a makeshift webbing dam in an attempt to force the fish up the Merced River at its confluence with the San Joaquin. George Warner, a member of the crew, would later write: "Despite very poor water quality they pushed and probed at the webbing, trying to get up their home stream. The small San Joaquin was mostly warm return irrigation water loaded with salts and chemicals. In contrast, the Merced flow was clear, purer, and much cooler. But it was not home stream water." A year later, San Joaquin spring-run chinook went extinct. "The damage done to the San Joaquin is some of the most extreme environmental damage caused by any water project anywhere," says Hal Candee, an attorney with the Natural Resources Defense Council, which has been trying for the past 18 years to force the federal government to restore flows for fish in the river. Now, the fight is finally reaching a resolution that may mark a new, albeit grudging, era of compromise — one that highlights the challenges of returning fish to a river, and a world, far different from 60 years ago. The quest to revive the San Joaquin began in 1988, when the Friant water users’ 40-year contracts came up for renewal. The Natural Resources Defense Council sued the federal government, charging that renewing the contracts without "reallocating" some water back to the river would violate the federal Endangered Species and National Environmental Policy acts. "We considered it a nuisance lawsuit initially," says Kole Upton, the chairman of the Friant Water Users Authority. But the NRDC borrowed a legal doctrine forged in the landmark fight to halt Los Angeles’ water diversions from Mono Lake, on the eastern side of the Sierra. That battle helped establish that a long-neglected part of the California fish and game code — known as Section 5937 — imposed a "public trust" responsibility on the state to protect fish populations below dams, above and beyond federal environmental law. "What’s trailblazing is the applicability of those principles to a federal project," says Phil Atkins-Pattenson, an attorney representing the NRDC in the lawsuit. As the San Joaquin case dragged on, the farmers began losing ground. In 1999, after the 9th Circuit Court of Appeals upheld a lower court’s ruling that the federal government had violated the Endangered Species Act when it allowed the contracts to simply roll over, the Friant water users began settlement negotiations. "It was a tough call, whether to cooperate and try to make this work, or do an all-out fight and force society to make a decision to dry up this community to try to restore a river that’s been dead for 60 years," Upton says. The negotiations turned on the contentious issue of how much water the farmers would have to give up to restore the river, and in 2003 the discussions fell apart on exactly that point. The following year, however, U.S. District Judge Lawrence Karlton ruled that, under Section 5937 of state law, the federal government was required to release as much water as necessary to restore the "historic" fishery.